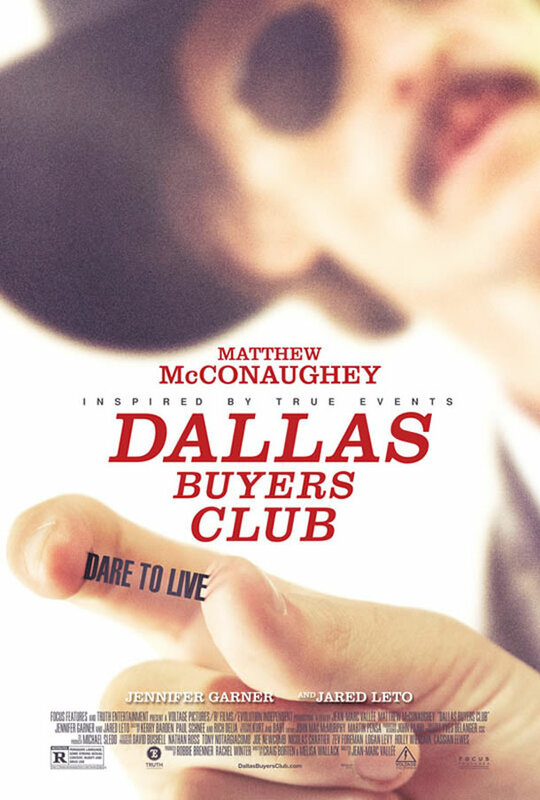 Synopsis: Matthew McConaughey stars in Dallas Buyers Club as real-life Texas cowboy Ron Woodroof, whose free-wheeling life was overturned in 1985 when he was diagnosed as HIV-positive and given 30 days to live. These were the early days of the AIDS epidemic, and the U.S. was divided over how to combat the virus. Ron, now shunned and ostracized by many of his old friends, and bereft of government-approved effective medicines, decided to take matters in his own hands, tracking down alternative treatments from all over the world by means both legal and illegal. Bypassing the establishment, the entrepreneurial Woodroof joined forces with an unlikely band of renegades and outcasts – who he once would have shunned – and established a hugely successful “buyers’ club.” Their shared struggle for dignity and acceptance is a uniquely American story of the transformative power of resilience. Review: There really are only two reasons to watch Dallas Buyers Club – Matthew McConaughey and Jared Leto. Yes, the “based on a true story” account of Ron Woodroof is a somewhat interesting movie, but without the amazing performances from the two leads, the movie would probably have felt much more generic. It’s not a stretch to say that McConaughey in particular carries the movie on his shoulders throughout, and it’s no surprise that he’s the frontrunner for the awards race this year. McConaughey’s last appearance on the big screen (for most cinemagoers) would have been Magic Mike in 2012, and in Dallas Buyers Club he is a literal shadow of the muscled male stripper portrayed previously. McConaughey lost more than 40 pounds to play Woodroof, but it isn’t simply the weight loss that impresses – this is bar none his best performance in his entire career, a nuanced, ferocious and at times truly moving portrayal of a man stricken with what was then seen as a terminal illness. Then there’s Jared Leto, who has taken an extended break from the big screen for a number of years to focus on his singing career with 30 Seconds to Mars. Yet he seems to have not lost his previous thespian form, and in his portrayal of the emotionally vulnerable transgender Rayon, we have a wonderful foil to McConaughey’s Woodroof. The movie’s most enjoyable moments are the interactions between the two, and the gradual shift in the dynamics of their relationship convinces because of the excellent chemistry between the two. These are transcendent performances, projecting the film into a whole different league on their own. Perhaps understanding that this is a performance-driven movie, Jean-Marc Vallee displays very little flair at the helm of the film, and it unfolds pretty much as a straight biopic. There are interesting elements to the plot, especially the protracted “battle” that Woodroof and the FDA engage in, but it does seem to somewhat underplay the paranoia and difficulties that surrounded HIV positive patients in that era. Woodroof’s overcoming immense odds to triumph (somewhat) holds a universal appeal, however, and although the subject matter may not be all that popular with cinemagoers, anyone who’s willing to pay the price of admission will likely find themselves with a rewarding cinematic experience.